This is a simple service of worship for the Christmas Season. It can provide the opportunity for worshippers to hear and see the Christmas story proclaimed in a format that goes beyond just reading the story, yet without the elaborate production that Christmas plays and musicals entail. Some participation is required in the service and by using different readers and singers as many as 20 people can be involved. It is written as a service of worship for Christmas Eve, but can easily be adapted for the first Sunday of Advent, or as part of the ongoing celebration of any of the Sundays of Advent. With some modification, it can even be used as a Christmas Day service or for one of the Sundays of Christmas. It can also be adapted as a children’s program, although as written it will have probably have more significance as a service of worship for the entire congregation. The focus of the service is a nativity scene that is constructed during the service. As the service progresses with the readings and music, the various elements of the scene are added until the entire nativity is complete. This can be as simple or as elaborate as the planners wish. The service is written here for a particular nativity scene used at our church. It uses simple carved wooden figures that range up to about a foot (30 cm) high placed in a wooden stable background measuring about three feet (90 cm) across. The advantage of using a nativity set is that many small churches can conduct this service without a lot of expense or resources. One disadvantage is that the figures must be large enough to be seen easily from throughout the sanctuary, which entails its own expense unless a large nativity set can be borrowed or is donated. The service can also be adapted to use a living nativity scene complete with participants in costumes in which the entire front of the church becomes the stable. In this case, for obvious reasons, the animals will most likely be eliminated or symbolic figures of animals used. I have seen churches use cardboard cutouts of animals made by the children of the church; the "quality" of the figures is not as important as the participation in the service by all members of the congregation, including the youngest! The advantage of a living nativity scene is the possibility for wider participation in the service and the effect of more personal involvement, especially on children. The disadvantage is the additional expense of costumes and the added time and responsibility of coordinating the service. Both the selection of music and how it is used can be adapted to the resources available in a local church. Normally, the music would be a combination of congregational singing and special numbers sung or played. However, this is one type of service that does not suffer by using taped music while the nativity figures are placed in the stable since the focus is more on the movement than on the music. This is especially useful for small churches with limited resources. The rather relaxed atmosphere created by the movement of people during the service, as well as the gathering of the congregation as the climax, allow this service to be a change of pace from some of the more structured services of worship during the Christmas Season. Likewise, the relaxed atmosphere can contribute to the sense of community that is so much a part of this season of the church year. The opening of the service directly ties this time of worship to the celebration of Advent during the preceding four weeks by lighting the four Advent candles (the fifth Christ Candle is not lit until later in the service). The lighting of the candles is accompanied by the Lectionary Readings from the Book of Common Prayer for Christmas Eve. If this service is conducted earlier in the Advent Season, the number of candles lit should correspond to that week of Advent (other appropriate Scripture readings may be found in Daily Advent Readings from the Book of Common Prayer). If a shorter service is desired, the Scripture readings at the beginning, except for the Psalm, can be omitted. Some care should be taken that there is no movement or distraction while Scripture is being read. The Scripture reading is not "background" for the lighting of the candles, but is the proclamation of the written word of God that is the heart of the service. The lighting of the candles should only be done after the Scripture reading is finished. They symbolize the light that God brings into the world, but it is the Scripture that bears witness to that light and defines its purpose. The movement of people should be carefully planned to allow all of the congregation to concentrate on the Scripture reading. It should be noted that this service is a deliberately constructed liturgy of worship. It does not try to duplicate the historical details of the nativity, except as a Faith confession that celebrates these events. For example, most historians acknowledge that the Magi, the Wise Men, were not present at the nativity but came perhaps as much as two years later (evidenced by the fact that Herod sought to kill all the boys in Bethlehem under two years old; Matthew 2:7, 16). Yet they are an integral part of the Christmas story as told by Matthew, and so are incorporated in this service. The various elements of the story come from different Gospels, Matthew and Luke. Each of those Gospels have different purposes in emphasizing different dimensions of the story. It is Matthew who presents Jesus as King of the Jews, with the story of the Magi and Herod. It is also Matthew that speaks of Jesus throughout the Gospel in royal imagery, with the Kingdom of God and Kingdom of heaven as a major theme. Matthew presents Jesus as the fulfillment of the expectations of the Jews for a new king, the fulfillment of the covenant with David. So he uses royal language and symbols as well as details from the life of Jesus to portray him not only as the Messiah, King of the Jews, but also as the King of Kings. Luke, however, emphasizes a different perspective. Luke is the Gospel of the outcasts. He goes to great lengths in his Gospel to portray Jesus as the friend of those whom society had rejected or who were considered socially inferior: lepers, the lame and sick, gentiles, women, and tax collectors, (for example, the story of Zacchaeus the tax collector only appears in Luke). There are many details throughout the Gospel where that emphasis becomes obvious. For example, in Matthew's version of the Beatitudes he has "blessed are the poor in spirit," while Luke has only "blessed are the poor" (Matt 5:3, Luke 6:20). It is easy to see Luke emphasizing Jesus' mission to the poor and despised of the world, a theme established early in the book of Luke as Jesus read the Isaiah scroll in Nazareth (Luke 4:16-30; see Lectionary Commentary on Luke 4:14-21). If we understand the book of Acts to be the second volume of Luke, we see that theme carried through Acts as the church embraces the Gentiles. This suggests that, for example, Luke's inclusion of the shepherd's story is a deliberate theological statement about Jesus' mission and thereby of the nature of God at work in the Incarnation, and as a consequence the nature of the Church as the proclaimer of Good News. It is not that one perspective is better, or more historical, or the "correct" version, that either Jesus is King or he is a friend of the outcasts of society. Both Matthew and Luke offer us truths about Jesus the Christ. As the exalted Christ, he is King of Kings and Lord of Lords, the incarnate Son of God for whom all the royal imagery in the world is woefully inadequate. Yet, he is also the "man for others," the physical expression of the love and compassion of God that sees value even in the worst of sinners, hope in the most hopeless of physical circumstances, and possibility where we see only endings. And in stooping to touch lepers, in speaking gently to prostitutes, and in weeping with friends at the pain of loss, Jesus reflects the compassion and grace of the King of Kings for ordinary people, symbolized so well in the Nativity by the poor and simple shepherds kneeling beside the wealthy Magi. The preparation for this service will depend on the type of service presented. Obviously, the preparation for a living nativity will be more time consuming. Likewise, if Communion is a part of the service, that will need to be prepared as well. While the service is not at all complicated, it is always better to have at least a rehearsal reading of the service with the participants. This helps participants focus on the service ahead of time as a service of worship, as well as allowing them to become familiar with the flow of the service to cut down on distractions. A time of prayer with all participants will emphasize that this is not just something to do for Christmas, but is a proclamation of the Good News of God’s grace. The readers should be carefully chosen and if necessary coached on reading. Nothing distracts from a service such as this more than a wooden reading of the Scripture. Readers do not have to memorize the material (requiring memorization will eliminate many people from being able to participate). But they should have the scripts far enough ahead of time to be thoroughly familiar with it and practice a lively reading with intonation. Different parts are not marked for different readers beyond the leader; the reading can be divided up according to the number of participants desired. Choosing the people to place the pieces in the Nativity can be a matter of preference. It can be done ahead of time and the people encouraged to participate in a read-through rehearsal before the service. In smaller churches, it can be done very informally at the beginning of the service with people invited to choose a piece that they would like to place in the nativity (children should always be included in such activities). The cr�che should have an internal light that can be easily turned on at the appropriate point in the service. A strong spotlight can also be used. For a Christmas Eve service a large white candle near the nativity can also be used, and lit along with the Christ candle on the Advent wreath at the appropriate place in the service. If this is a service earlier during Advent, neither candle should be lit since traditionally the Christ candle is not lit until Christmas Eve. As a Christmas Eve service, the final gathering of the people around the Nativity can also be the occasion for sharing Communion or Eucharist. Care should be taken with Communion on Christmas Eve that it does not become a somber occasion, but a genuine Eucharist, a thanksgiving. It is a remembrance of Jesus’ death, but it is also a celebration of new life, symbolized even more powerfully by the images of the nativity and the Christ-child. 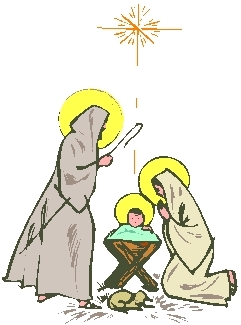 The Nativity should be placed at the front of the church and left in place until Epiphany (January 6), the end of the Twelve Days of the Christmas Season. In many evangelical churches, it is common practice to use the communion table for seasonal decorations. While that might be appropriate for some symbols used in worship, the Advent Wreath for example, it is usually a better practice to use a separate table for seasonal symbols. In the case of the Nativity, it should not be placed on the Communion table, since it is likely that Communion will be celebrated before Epiphany. Leader: Welcome to our Service of the Nativity. We began a journey four weeks ago, a journey that will follow Jesus through this church year. We have watched and waited these past four weeks of Advent, anticipating the Coming of the Christ. And now our wait is over as we celebrate the birth of the Christ-child. But even as we celebrate on this night a new act of God in history, we realize that this is not the end of our journey. It is only the beginning. There is much yet to come. And much to do. But here tonight, we come before God in praise and celebration, because of the newness and possibility that God has brought to us in the birth of this Child. We will light the candles of Advent tonight to remind us of the journey that we have begun. The increasing light reminds us of the light that is coming into the world to enlighten every person. God is our refuge and strength, a very present help in trouble. Therefore we will not fear, though the earth should change, though the mountains shake in the heart of the sea, though its waters roar and foam, though the mountains tremble with its tumult. There is a river whose streams make glad the city of God, the holy habitation of the Most High. God is in the midst of the city; it shall not be moved; God will help it when the morning dawns. The nations are in an uproar, the kingdoms totter; he utters his voice, the earth melts. The LORD of hosts is with us; the God of Jacob is our refuge. Come, behold the works of the LORD; see what desolations he has brought on the earth. He makes wars cease to the end of the earth; he breaks the bow, and shatters the spear; he burns the shields with fire. Action: The First Advent Candle is lit. Strengthen the weak hands, and make firm the feeble knees. Say to those who are of a fearful heart, "Be strong, do not fear! Here is your God. He will come with vengeance, with terrible recompense. He will come and save you." Then the eyes of the blind shall be opened, and the ears of the deaf unstopped; then the lame shall leap like a deer, and the tongue of the speechless sing for joy. For waters shall break forth in the wilderness, and streams in the desert; the burning sand shall become a pool, and the thirsty ground springs of water; the haunt of jackals shall become a swamp, the grass shall become reeds and rushes. Action: The Second Advent Candle is lit. Let the same mind be in you that was in Christ Jesus, who, though he was in the form of God, did not regard equality with God as something to be exploited, but emptied himself, taking the form of a slave, being born in human likeness. And being found in human form, he humbled himself and became obedient to the point of death-- even death on a cross. Action: The Third Advent Candle is lit. Leader: Will everyone please stand for the reading of the Gospel. Then his father Zechariah was filled with the Holy Spirit and spoke this prophecy: "Blessed be the Lord God of Israel, for he has looked favorably on his people and redeemed them. He has raised up a mighty savior for us in the house of his servant David, as he spoke through the mouth of his holy prophets from of old, that we would be saved from our enemies and from the hand of all who hate us. And you, child, will be called the prophet of the Most High; for you will go before the Lord to prepare his ways, to give knowledge of salvation to his people by the forgiveness of their sins. By the tender mercy of our God, the dawn from on high will break upon us, to give light to those who sit in darkness and in the shadow of death, to guide our feet into the way of peace." Leader: This is the Good News of God's Word to His people. Congregation: May it be so among the people of God. Action: The Fourth Advent Candle is lit. Leader: The Nativity brings together Mary, Joseph, the Christ Child, the Shepherds, and the Angels. And even though the wise men probably did not appear at the manger, they are an integral part of the Christmas story. And so we include them in the scene in order to tell the story of the birth of Jesus the Christ. The Nativity is a visual proclamation of the Christmas story. Each piece of the Nativity unfolds the story of Christ’s birth. As in the day of Jesus’ birth, so today his coming brings joy and hope to many. 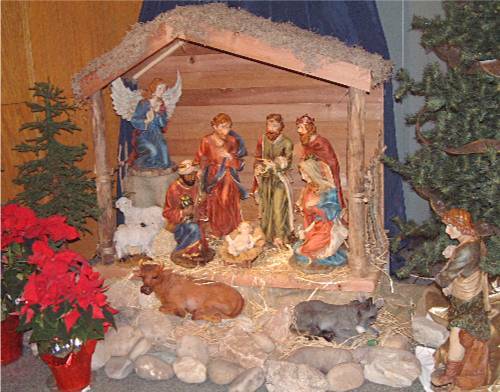 To some, the Nativity is an issue of controversy. They say that The Nativity is a religious expression, a Christian symbol. We must agree with those in our day who claim that the Nativity is a religious expression. It is a pictorial statement of faith, a uniquely Christian symbol of what we believe about God and His revelation of Himself in our world. In placing the Nativity in our yards and on our mantels we are declaring our hope in the God who invaded human history. In so doing He reveled Himself to humanity, expressing the reach of His love as He chose to walk along side those whom He created in His own image. So, we have placed a Nativity in the front yard of our Church. It declares to those who drive by that we have a wonderful story to tell. That story is how the Creator God became one with those He formed. It is a story of hope because God built a bridge of Divine Love from Himself to us. It is a story that shines through the birth of every child and resonates in the supportive ties of every family. And tonight we begin our Christmas Season with this Service of the Nativity. Through it we will again tell our story. Congregational Song: Come, O Come, Emmanuel! It had all began some time ago when Mary and Joseph were making wedding plans. They dreamed of their future together. The love that united them seemed indestructible. Then, unexpectedly, Mary was encountered by a heavenly visitor. And having come in, the angel said to her, "Rejoice, highly favored one, the Lord is with you." But when she saw him, she was troubled at his saying, and pondered what manner of greeting this was. Then the angel said to her, "Do not be afraid, Mary, for you have found favor with God. And now, you will conceive in your womb and bring forth a Son, and you will name him Jesus. He will be great, and will be called the Son of the Most High; and the Lord God will give Him the throne of His father David. And He will reign over the house of Jacob forever and of His Kingdom there will be no end." Action: Mary is brought and placed in the Nativity during song. Action: Joseph is brought and placed in the Nativity during song. It was a crowded city that night, Bethlehem, the city of David. People from all over had returned to the city of their fathers. Here they would register and a census would be taken. Joseph and Mary sought for a place to stay. An inn. A room somewhere, anywhere. A safe place from the chilly night air. But there was no place, no room in the inn. At the city’s edge was a stable, a place where animals could be protected and fed. There, in a stable, Mary and Joseph found warmth and protection. They would stay here until a new day brought light. Action: Jesus is brought and placed in the manger during the first verse. Action: The animals are brought and placed around the Nativity during the second verse. Special Song: What Child is This? Now there were in the same country shepherds living out in the fields, keeping watch over their flock by night. And behold, an angel of the Lord stood before them, and the glory of the Lord shone around them, and they were terrified. Then the angel said to them, "Do not be afraid, for behold, I bring you good news of great joy for all people. For there is born to you this day in the city of David a Savior, who is Christ the Lord. And this will be the sign to you; You will find a Child wrapped in bands of cloth, lying in a manger." Action: The angels are brought and placed in the Nativity during the first verse. Action: The shepherds are brought and placed in the Nativity during the third verse. Now after Jesus was born in Bethlehem of Judea in the days of Herod the king, behold, wise men from the East came to Jerusalem, asking, "Where is He who has been born King of the Jews? For we have seen His star in the East and have come to pay him homage." ‘But you, Bethlehem, in the land of Judah, are by no means least among the rulers of Judah; For from you shall come a Ruler who will shepherd My people Israel.’"
Then Herod secretly called for the wise men and determined from them the exact time when the star had appeared. Then he sent them to Bethlehem and said, "Go and search diligently for the child, and when you have found Him, bring back word to me, that I may come and pay him homage also." When they had heard the king, they departed; and there, ahead of them, went the star that they had seen at its rising, until it came and stood over where the child was. When they saw the star, they rejoiced with exceedingly great joy. And when they had entered the house, they saw the child with Mary His mother, and fell down and paid him homage. Then opening their treasure chests, they presented to Him gifts of gold, frankincense, and myrrh. Then, being divinely warned in a dream that they should not return to Herod, they departed for their own country another way. (Matthew 2:1-12). Action: The Magi are brought and placed in the Nativity. Leader: Heaven looked down on that Holy Night as a manger became an altar and a stable became a cathedral. History now looks back to that moment in time when God came in Jesus to reveal Himself to people everywhere. The humble shepherds were there. The Wise Men bowed before Him. And tonight you and I join them as we gather around the manger. What a night! A Holy Night! A night of hope for today and tomorrow. Action: During this song, the congregation gathers around the Nativity. Leader: O God, you have caused this holy night to shine with the illumination of the true Light. You have given us your only-begotten Son to take our nature upon Him to reveal to us your glory and grace. As you have given this gift in love, may we receive it with joy. Grant that we, being regenerate and made your children by adoption and grace may daily be renewed by your Holy Spirit. Grant us, we pray, that as we have known the mystery of that Light upon earth, so may we also reflect that light to a darkened world; through the same Jesus Christ our Lord, who lives and reigns with you, in the unity of the Holy Spirit, one God, now and forever. Amen.